Choking results when some solid body or substance becomes fixed in some part of the oesophagus or gullet. In this condition swallowing is either imperfectly performed or rendered altogether impossible, according to the size and form of the object, and in some measure also to the position occupied by it. This mishap is of seldom occurrence in the horse, but in the ox, whose food is but imperfectly chewed prior to rumination, it is comparatively common. Fig. 96. - Choking in the Throat. Various substances have been found from time to time to obstruct the gullet. 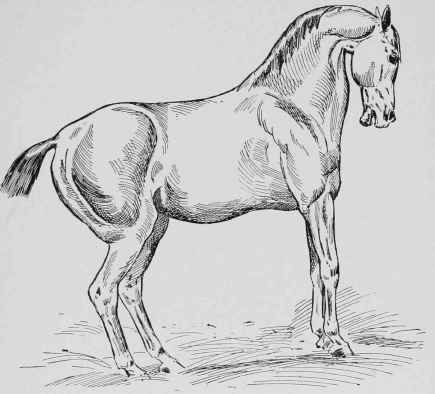 Eggs and onions, given by grooms with the idea of improving the condition of the horse, have on several occasions resulted in choking. Pieces of carrot, turnip, and mangold, balls, hay imperfectly masticated and hurriedly swallowed, thorns, pieces of stick, wire, etc, are among the more common offenders. The situation of the obstruction varies in different cases. Sometimes it is high up in the throat, at others in the course of the neck, and in some instances low down in the chest, near to the stomach. Whether it be in one position or the other it is a state involving considerable difficulty and danger, and requires to be dealt with promptly and deliberately. The symptoms of choking are not always the same, the difference depending upon the seat and nature of the object causing it. Although certain well-marked signs of the accident are usually present there are cases in which a diagnosis is difficult to accomplish. Where the impediment is in the throat the symptoms are such as may be mistaken for ordinary sore throat. 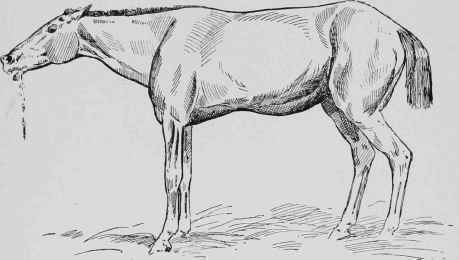 The nose is poked out and the head is carried somewhat stiffly (fig. 96). Repeated attempts are made to swallow, each effort being attended with marked pain. The jaws are moved restlessly about, and a discharge of saliva issues from the mouth. Food is refused, and should an attempt be made to drink, some of the fluid will pass down the nostrils and some may enter the respiratory passage and provoke an outburst of convulsive coughing. Pressure on the throat causes pain and may reveal the presence of the offending body. These symptoms are specially marked in the case of thorns, sticks, and other pointed substances. Should the obstructing mass be large, and cause pressure on the windpipe, the breathing will be interfered with, and may be very difficult and noisy, with heaving at the flanks and general indications of distress. Choking in the course of the neck and in that part of the gullet which passes through the chest is attended by violent retching and attempts to vomit. During the paroxysms or fits, the muscles of the neck are first violently contracted, the chin is forcibly drawn towards the breast, and the crest is sharply arched (fig. 97). At this time the eyes stare, the face wears a painful and anxious expression, and ultimately the muscles of the entire trunk become more or less convulsed. 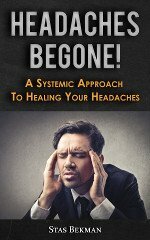 Any impediment lodged between the throat and the lower third of the neck will be readily felt, and in cases of high choking are distinctly recognized as a bulging in the channel of the neck. Should relief be long delayed the body becomes swollen up with gas, and with it abdominal pain occurs as the result of impaired digestion. Here the object is clearly to remove the obstruction. Haste and excitement are to be avoided in dealing with this as with all other accidents, but no time should be lost in devising means for freeing the passage from the object obstructing it. Any suspicion of trouble in the throat must be promptly acted upon - nay, it is good practice in all cases where doubt exists as to the seat of the stoppage to introduce the hand into the mouth and thoroughly explore the pharynx or cavity behind. Should the offending body be found there, careful handling usually suffices to effect its removal. Where the impediment is seated in the neck, an attempt should be made to move it upward or downward by gentle pressure, first in one direction then in the other. This will be facilitated by first giving the patient a small quantity of linseed-oil. Imperfectly chewed hay or straw may be broken down, by careful manipulation from without, and caused to disperse, but solid substances will require to be bodily removed. If this cannot be accomplished by the means suggested, the probang or "choke rope" must be introduced. In performing this operation the instrument is passed over the tongue and carefully forced along the gullet until the obstruction is reached, when gentle and continuous pressure is to be kept up. Violent and spasmodic movements of the instrument are to be strictly avoided. In some instances such a mode of procedure has resulted in fatal wounding of the gullet. PLATE XXIV. 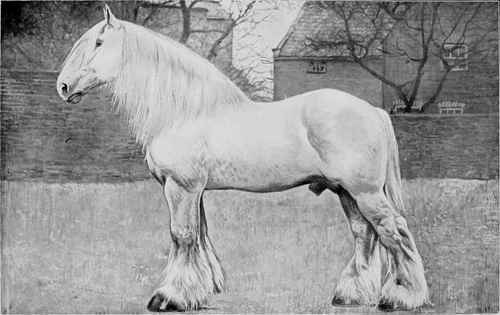 SHIRE HORSE: LINCOLNSHIRE LAD II By Lincolnshire Lad 1196; dam, Madam by Matchless 1506. The Property of F. Crisp, Esq. Fig. 97. - Choking in the Neck. Should all these methods fail, there is nothing left to be done save to cut down on the obstruction when accessible and remove it. Animals relieved of choking should be made to fast for twelve to twenty-four hours, a little thin gruel only being allowed during that time, and for two or three days afterwards the food should be soft or even sloppy.